Depending on the request, the data may be sent to different institutions, such as: the Central Depository, Financial Supervisory Authority, Deposits and Consignments House (CEC), National Agency for Fiscal Administration, financial investment services companies (brokerage companies) administrative and judicial institutions, the data retention period being 50 years. In the absence of the data requested by this form, we are unlikely to be able to respond to your requests. However, if you have restraints, you may contact us by other means of communication. The investments in research and quality as well as for updating the manufacturing technologies have turned Antibiotice into a profitable, dynamic, investor-attractive company. 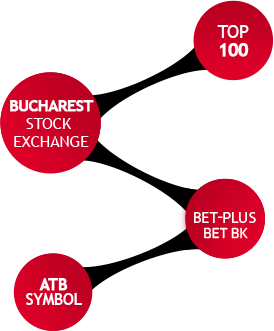 Traded under the ATB symbol, our company’s shares are issued in a dematerialized form and are freely transferable. A representative from our Investor Relations Department will contact you to set up a meeting. Thank you!